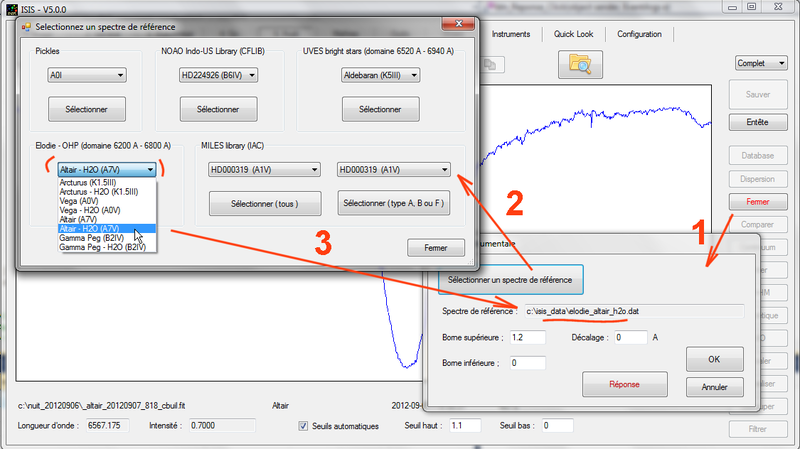 This tutorial is a guide to learning ISIS especially for the processing of spectra taken with Lhires III spectrograph. However, this guide contains numerous practical information on the use of ISIS, in particular a description of the new features of version 5. Even if you do not operate the Lhires III spectrograph, reading and implementation of the proposed exercise can be very beneficial. Raw images to achieve the processing can be downloaded (see link below). The organization of the paper is a short step by step learning, based on concrete examples. 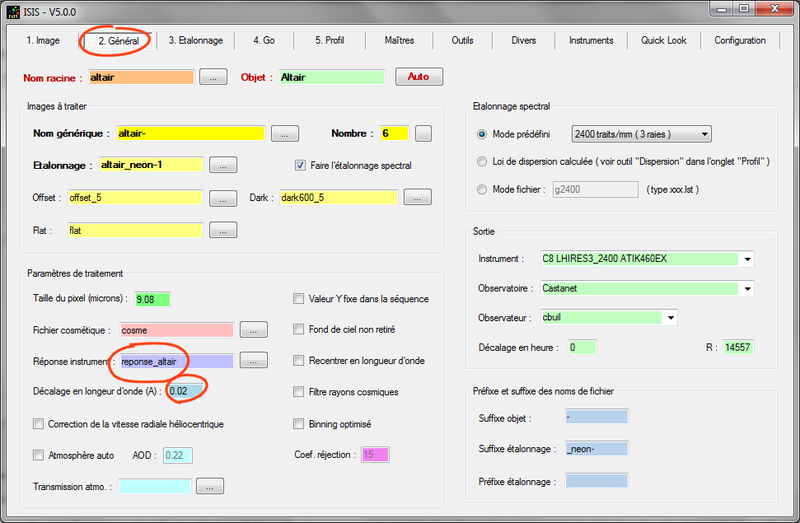 Procedure for change ISIS langage interface. The star spectrum is the horizontal line that bar image. The image shows a portion of the spectrum centered on the hydrogen red line, Halpha, at wavelength 6563 Angstroms (6563 A). Note that I am not a very supporter of paths like C: \ Documens and Settings \ ... \ ... \ ... There is no standard for storing and organizing data directories suggested by the designer of the operating system, far from being practical and rational in a scientific context. Make simple. 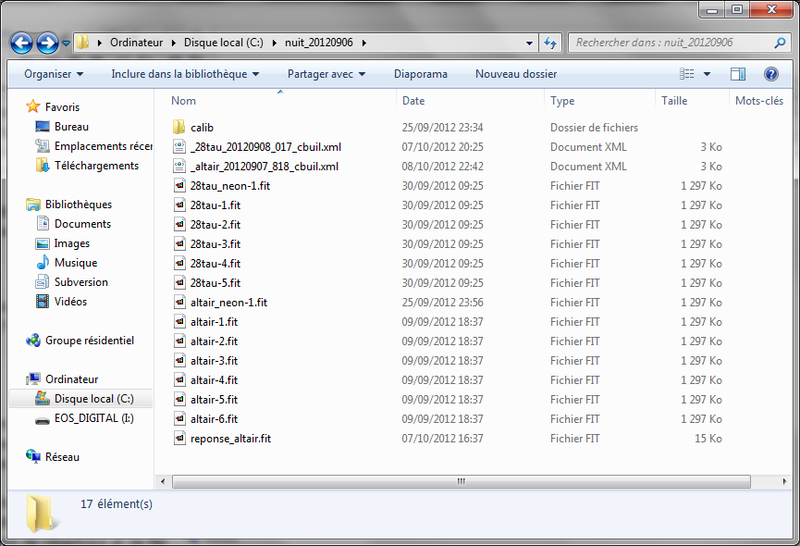 There is no indication against access your working folder from the root C:, for efficiency. Optionally add a directory level, but not much from my point of view. The construction of the directory name is quite logical. 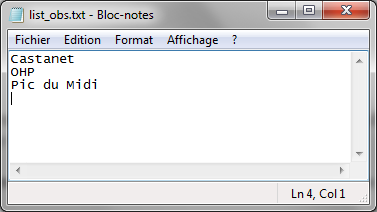 The word "night" (“nuit” in french langage) identify the nature of the data in your computer (again, you can choose a different name). It was then followed by the observation date (in US format U.S.: YYYYMMDD). Note that I adopted the separator symbol "_". Avoid absolutely the white character for folder and file names. This is technically a disaster (nothing looks more like two white and one follow white, for example), and you'll go crazy some users will want exploit scientific data. You have been warned! Note the presence of a subdirectory CALIB: it is optional. 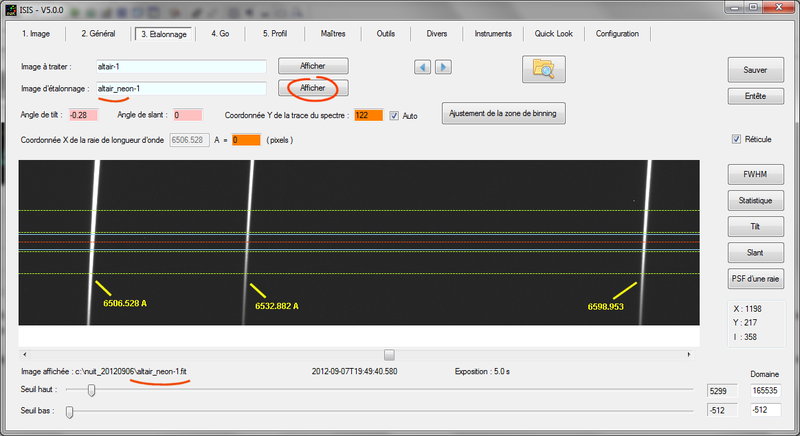 It contains useful data for calibrate the spectra and can be used without modification in a work session to another. Now run the ISIS software. Before processing your first spectrum, we have to make some adjustments. Assure you, for the most part, they are to do once. You will find your choice at the next work session with ISIS. 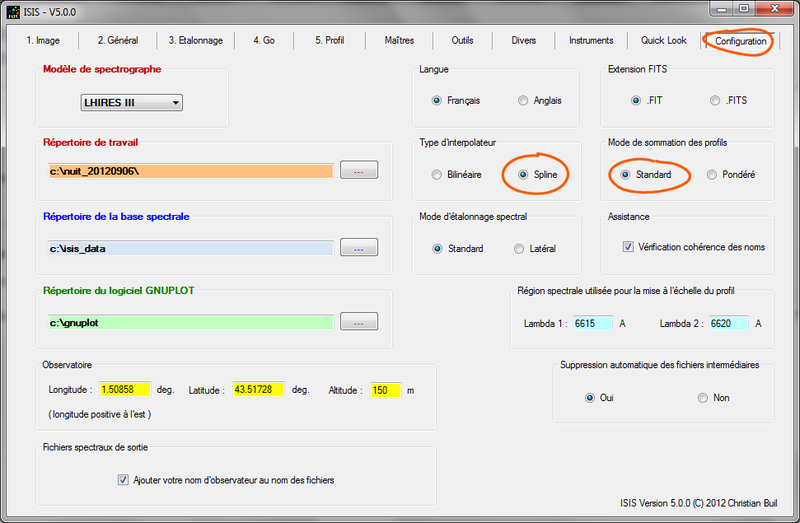 ISIS interface is composed of a series of tabs. Also note that you can enlarge the application window by dragging the lower right corner of the window with the mouse pointer. Open the "Settings" tab. 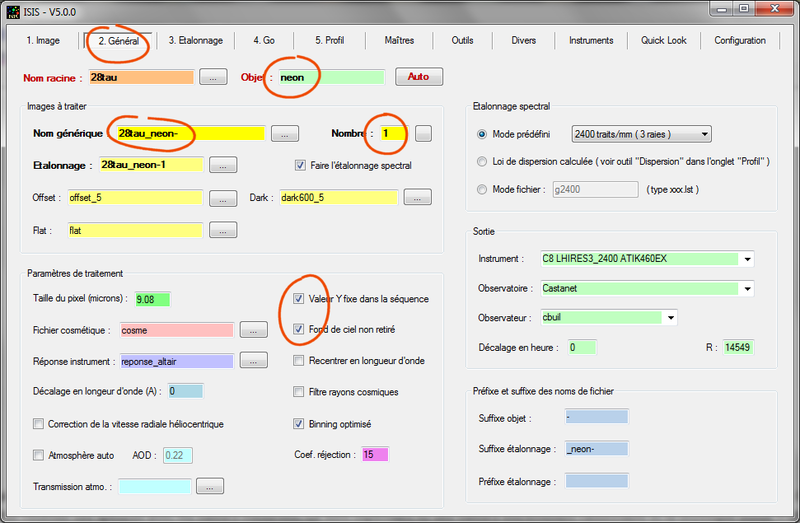 In the section "Model spectrograph", select LHIRES III, since we are process data from this model. Then, specify the path of working directory (or folder). Here i c: \ nuit_20120906 (you can enter letter in uppercase or lowercase, it does not matter). Finally, provide numerical values ? 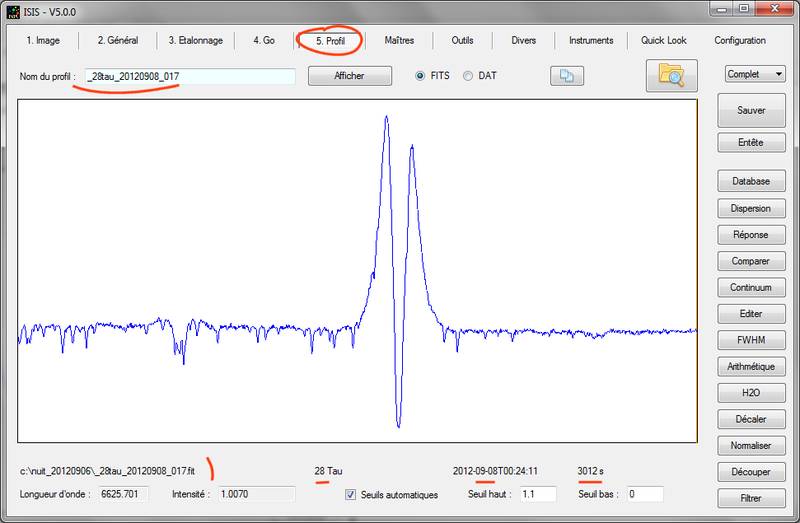 ?for fields "Lambda 1" and "Lambda 2" in "Spectral domain used for profile scaling", respectively 6615 and 6620 values??. These are wavelengths are in angstroms. They define a range in your spectra where ISIS calculate intensity for normalise the spectra (scaling). You will see the effect later. We choose an area if possible without spectral lines. Use the values ? ?that I propose. Note that the ISIS database is installed (c: \ isis_data). It is a folder that contains a variety of useful spectra for the time of spectra calibration, we have the opportunity to see. Installing the ISIS data base is a PRIOR important. If you have not already, check out this page which gives you the procedure. Note that the name of the image is automatically copied into the "Image Name" field at the top of the window, but not the file extension. 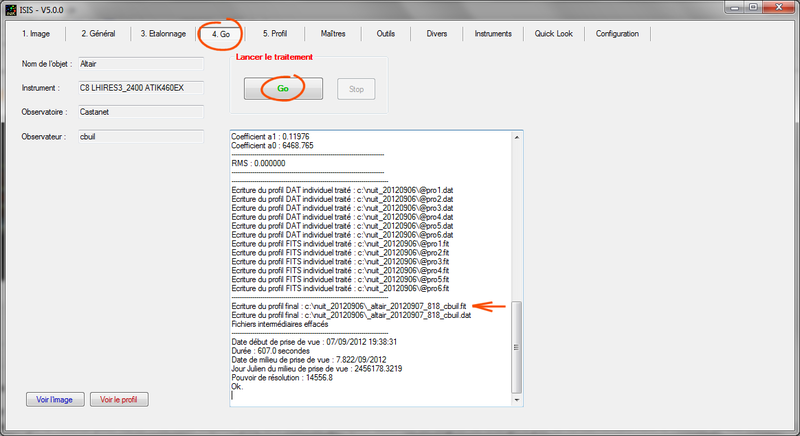 For keyboard experts, you can enter here perfectly the name of a valid FITS file, then click on the "View" button to view the contents (or <Return> from the keyboard). You can adjust the display contrast by turning the sliders at the bottom of the window. Take the opportunity to resolve the sliders excusion dymanic. The actual values shown are typical. 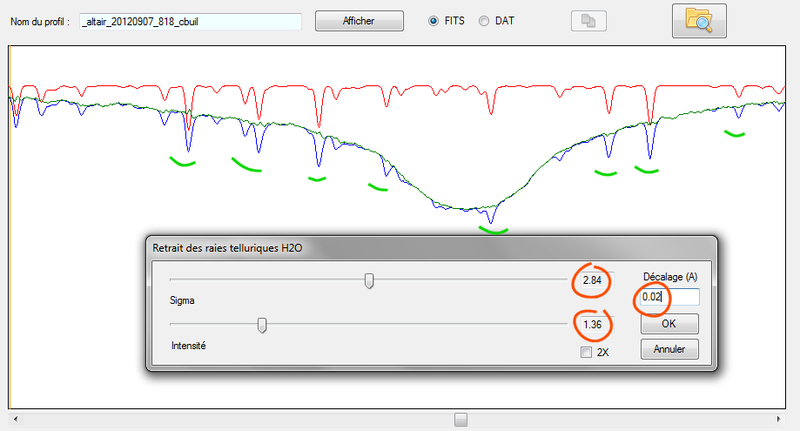 It is possible to indicate negative threshold values, very useful to distinguish the image backgound of, often too dark without it. 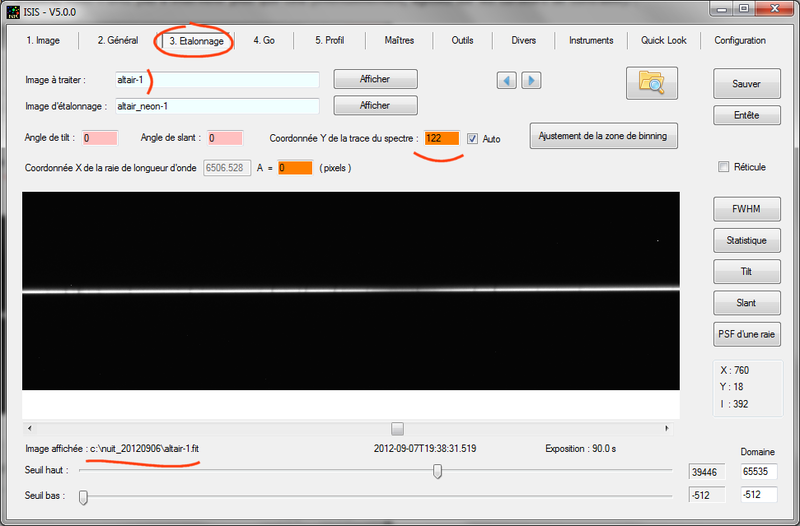 Small "arrows" buttons can move forward in the sequence of images (recall, we have 6 Altair images). The image displayed automatically. You must stop of the image name structure. It is critical point to efficiently exploit ISIS and quickly process your spectra. When you specify a file name you never to add the extension. ISIS adds extension for you in the background. If you forget the extension, the name itself is the example is: altair-1. (2) a suffix, which will serve as a separator between the "root" name and index. In our example the suffix is the symbol "-". You are completely free to choose the suffix, which can be perfectly composed of several letters. 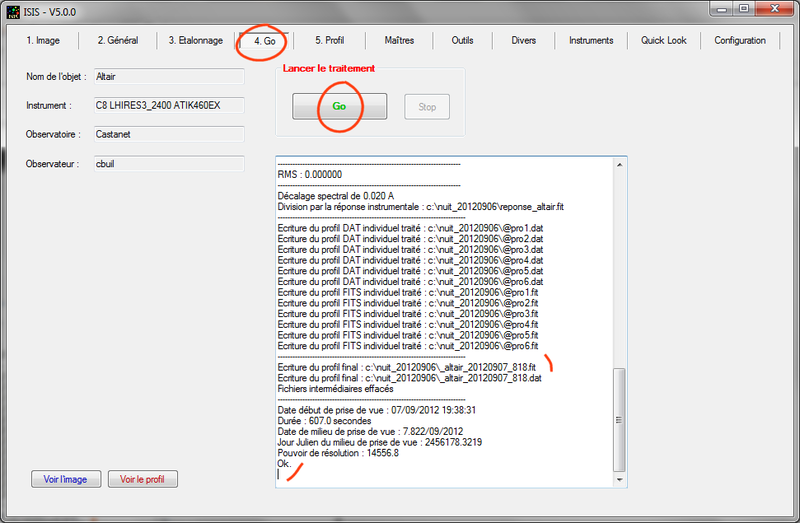 However, the single dash is a good idea if your acquisition software agrees: it's short, simple, easily identifiable. (3) a root name here "altair". We must choose carefully. Avoid long names, it is useless. Except for the brightest stars (Vega, Altair, Deneb, Sirius ...) avoid a root name as "Cor Corali." Typo risks is considerable, it is difficult to enter from the keyboard, it is not always recognized by professional databases, this is not scientific ... Prefer HD numbers or ultimately, the Flamsteed designation (zeta_oph, DeltaCep, ...). Even if it is managed by ISIS, also avoid white character in names (to be replaced by the character 'undescore', "_"). ISIS often requires as a parameter the name of a generic sequence. The generic name is composed of the fusion of the root name and the suffix. In our example, the generic name is "altair-". 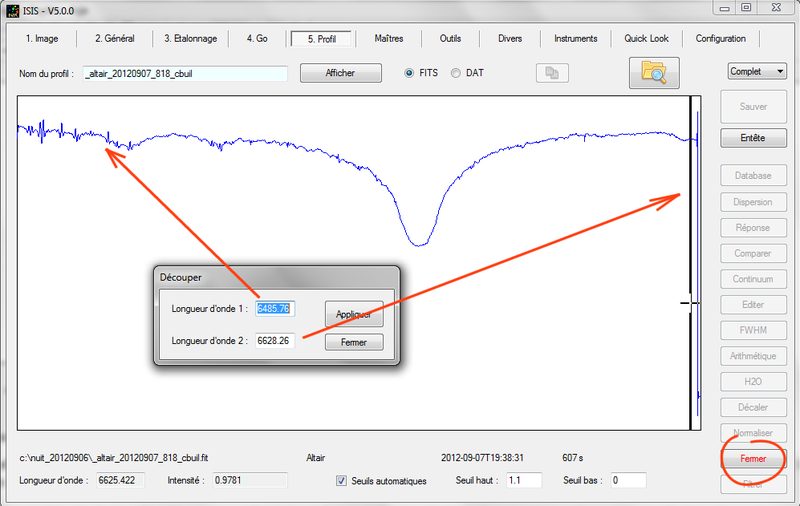 In the data provided for this tutorial, you'll find very specific files. Their name finish with .xml extension. The computer experts will recognized the signature XML format file. We can arrange hierarchically data in these files for example. This is one of their major interests. Whenever you use ISIS to process a sequence of spectra (or individual spectrum), it keeps trace of this processing, saved in a XML file. Everything that is needed to replay the processing days or years after the first processing is contained in the XML file. This possibility is of course very interesting for analysis and make adjustments for example. 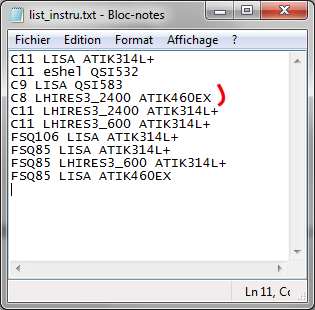 I have already processed the Altair sequence and I have added the corresponding the configuration file in the distribution file for this guide. 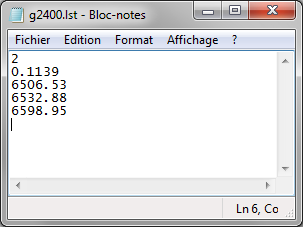 For now, I suggest you replay the complet processing by using the XML file. This will already very informative! The calculation takes only a few moments. 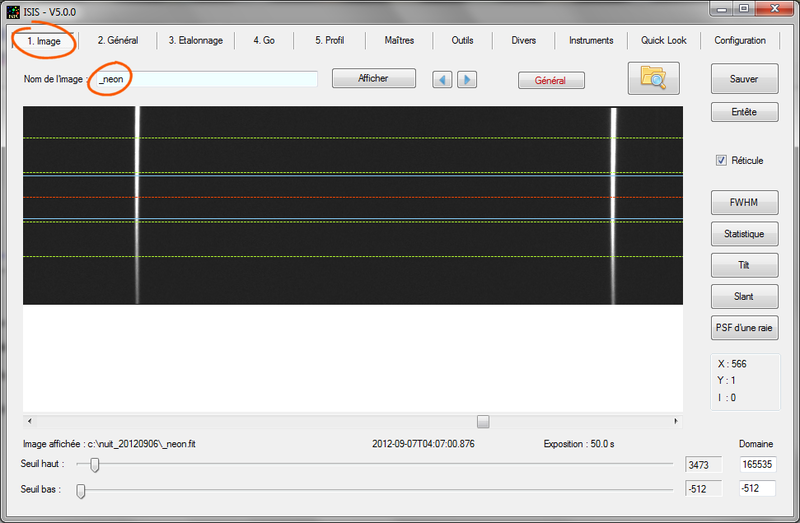 The result is the spectral profile "_altair_20120907_818.fit" stored by ISIS in the working directory. The structure filename result is immutable. The name always starts with the character "_". Then, the object name (this is not necessarily the root name). 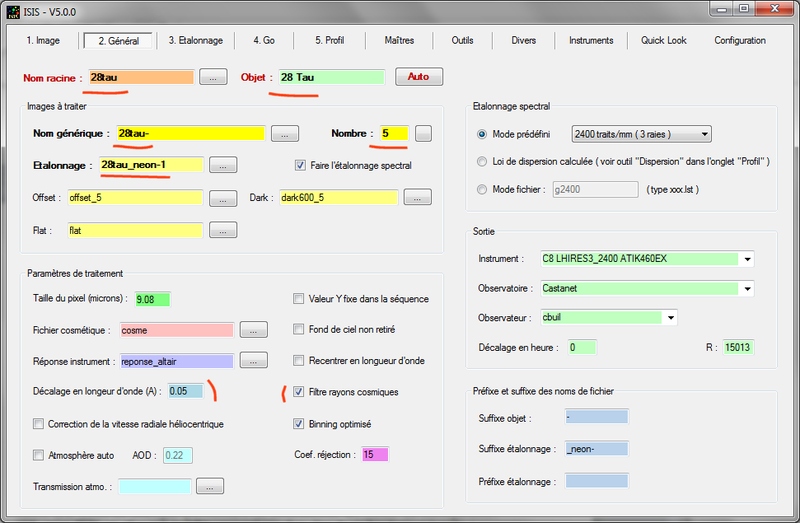 Finally comes the start date of the observation in the format AAAAMMDD_FFF with FFF, the fraction of a day. The spectrum is calibrated in wavelength. When you move the cursor horizontally, the actual wavelength value that appears at the bottom of the tab change. 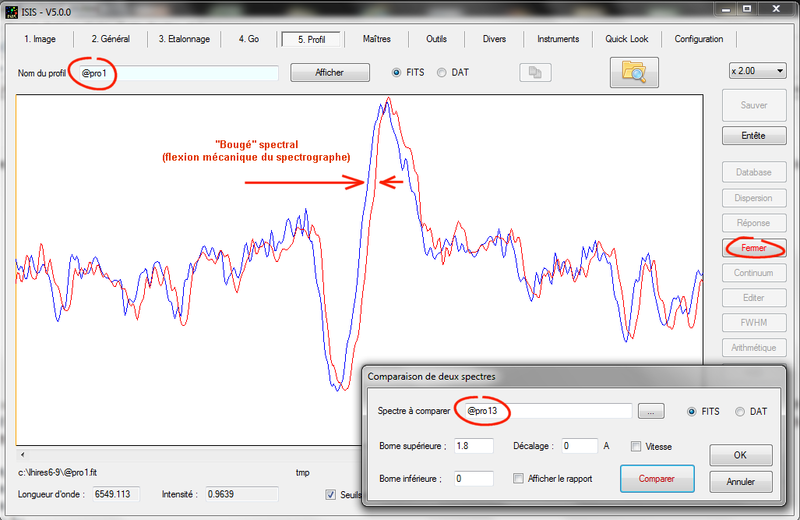 The spectrum is also corrected for instrumental response (the instrumental response contain flux distortions in stellar flux induced by variations of atmposhéric transmission or spectral sensitivities of the instrument. The spectrum is also normalized to unity around wavelengths Lambda Lambda 1 and 2 (adjusted in "Settings" tab). It is instructive to process the spectrum of another star performed during the same session. 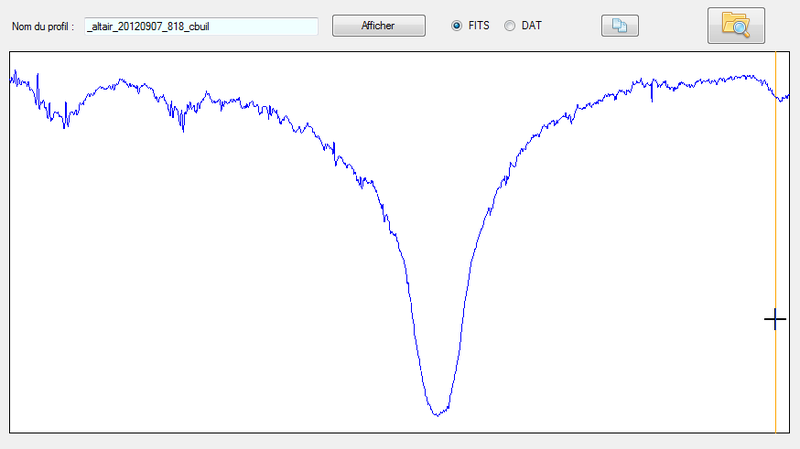 I chose the example of the spectrum of 28 Tauri, a Be-type star (star B shows the hydrogen lines in emission). We have obtened five spectra images, each exposed 600 seconds. The XML file processing is available for this star in the working directory (_28tau_20120908_017.xml). Load in the usual way, as described above, from the "General" tab. 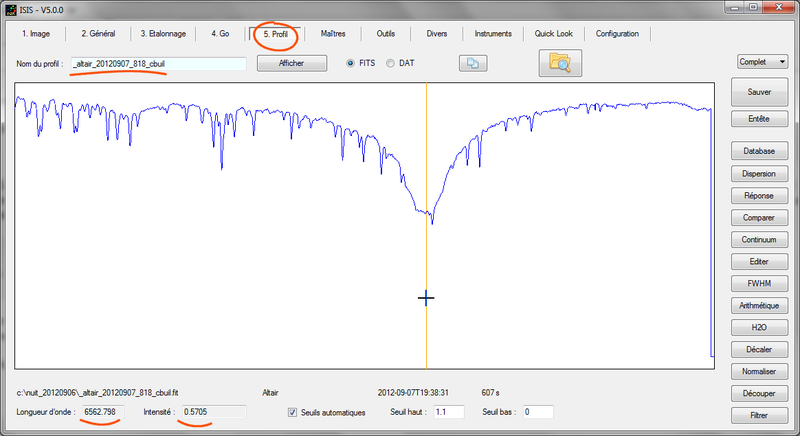 For the most part, the differences with the Altair processing correspond to bold enhanced fields. 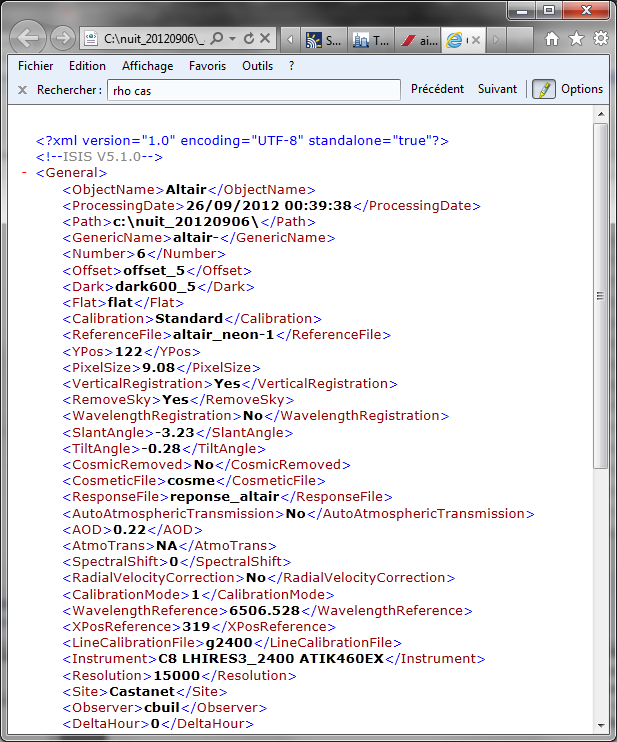 Logically, the differences between Altair and 28 Tau settings concern the name of the raw file, the "catalog" name of the object and the number of acquired images. It there is very little information to provide ISIS to move from one star to another when processing a full session. It is a guarantee of ease of use and reliability (limitation of error risk). 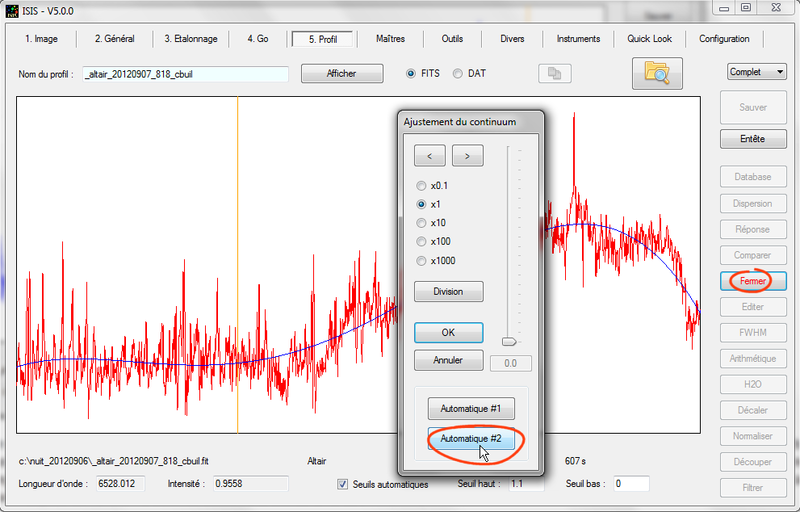 (1) Calculate the master images offset signal (or bias), the thermal signal and flat-fied. 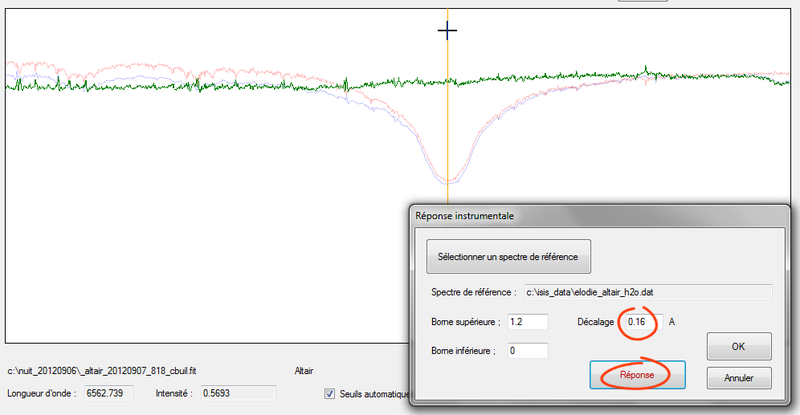 (2) Select a method for producing the spectral calibration, i.e. 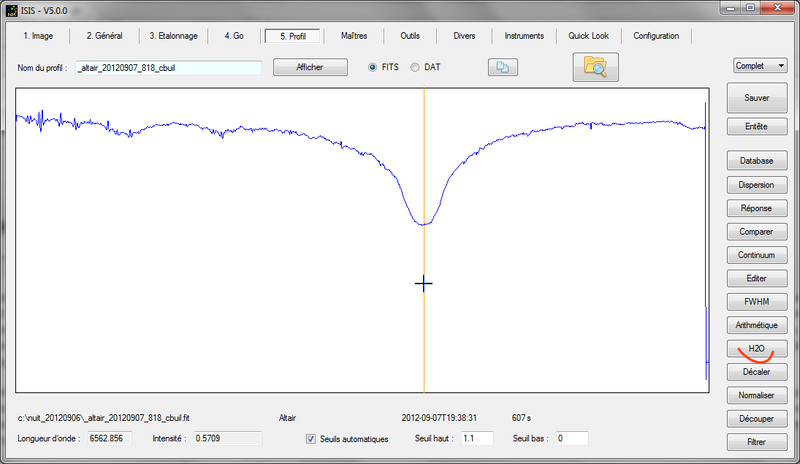 attaching a wavelength at each measuring point as accurately as possible. (3) Extract the global instrumental response, i.e. 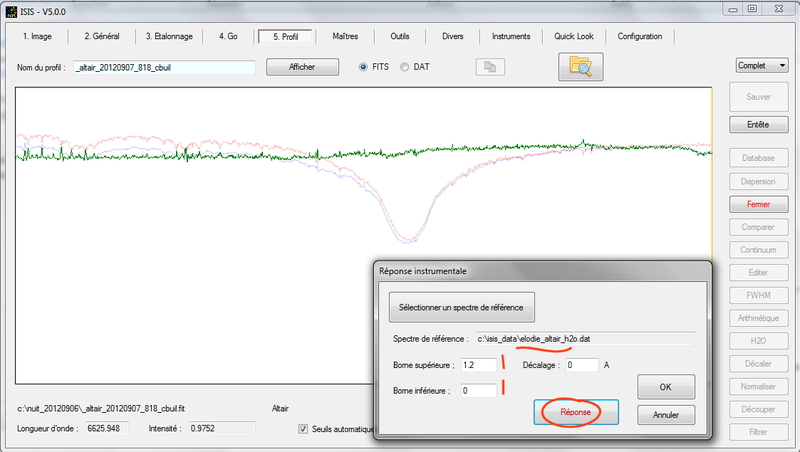 the way in which your instrument attenuates the objsect signal in function of wavelength. The ideal instrument would be that offering a flat response, mitigating the same way all wavelengths acquired. There not count! The reasons for a non-uniform response in wavelength are too many: the optical transmission of the telescope, the spectrograph, the spectral response of the detector (the quantum efficiency) and also atmopsheric transmission, which is regarded as part of the instrulental response in ISIS in most situations. So, first we need to build master images. These are reference images eliminate bias and distortions induced essentially by detector and its environment. The procedure is quite similar to that used in deep-sky imaging. Note that masters images are optional. . If you can't have for one reason or another one of these reference images (or master) you can leave the corresponding fields blank in the "General" tab. Avoid using this trick: these reference images are really needed to produce high quality results. Go here for detailed explanations on how to obtain master images from ISIS. Fields corresponding to the master images have been completed. We took the opportunity to define some suffixes (separators with index in a sequence). Try to be both comprehensive but compact. 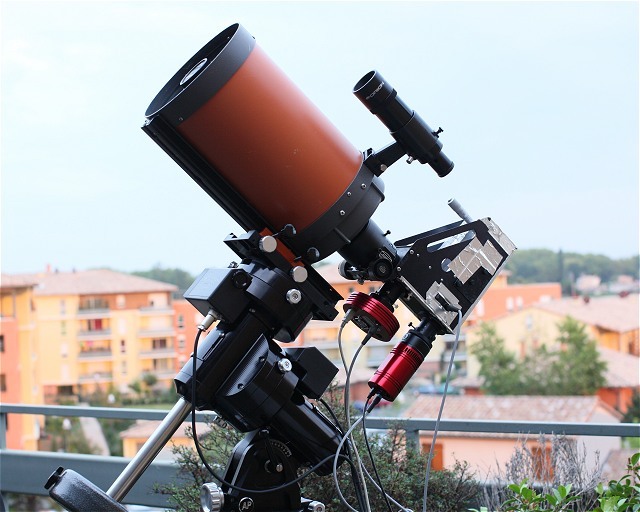 For the instrument, indicate in the order the type of telescope (Celestron 8), the type of spectrograph (LHIRES III equipped with a 2400 lines/mm grating ) and the type of camera (model Atik460EX). Also specifies the name of the observatory as well as your name observer (cbuil for Christian Buil, for example). 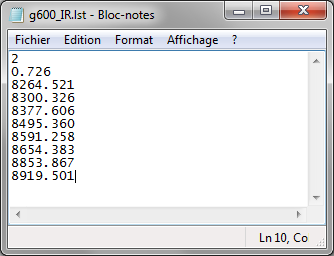 or fot the observatory - a file named (mandatory) "list_obs.txt"
and a list of observers, the file "list_observer.txt." Tip: If your spectrograph is not in the list, select the template LHIRES III, an option that provides the most general utilities in ISIS. 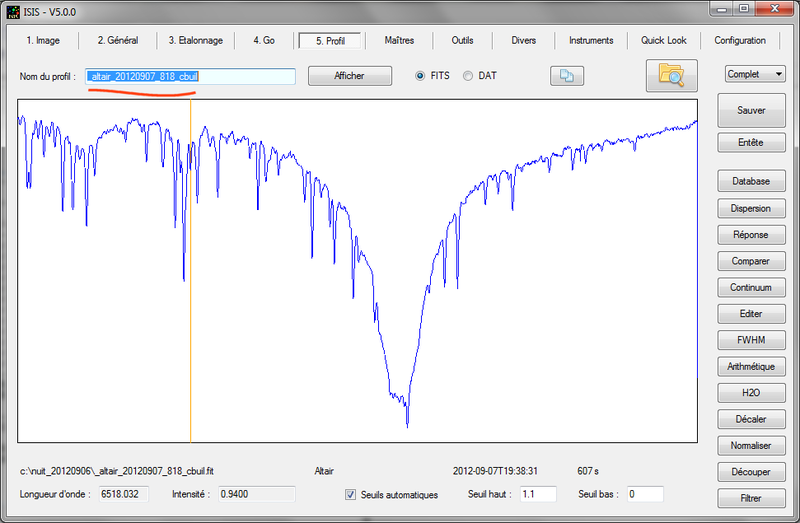 We now make spectral calibration of Altair spectrum (from the sequence altair-1, altair-2, ...). 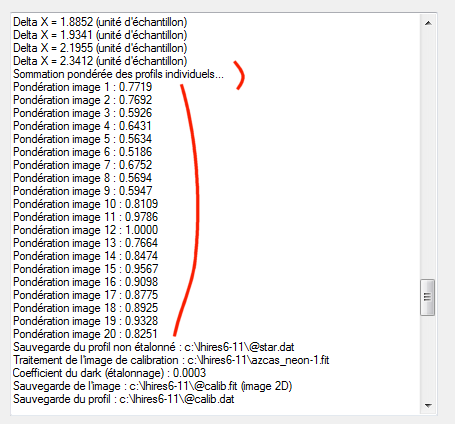 ISIS automatically constructs the name of the calibration image by adding the root name "Altair" and calibration suffix "-_neon", but also an index number that is always "1" in this case. This is an arbitrary choice. It is assumed here that you are likely to have acquired a sequence associated with the neon lamp during Altair observation (altair_neon-1-2 altair_neon altair_neon-3, ...), but only the first frame of the sequence is considered here. 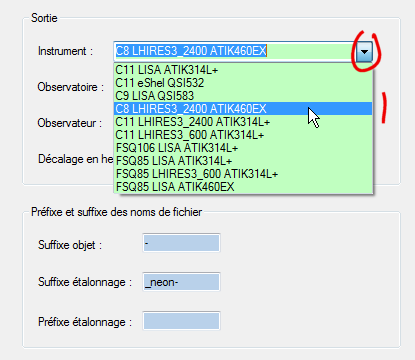 You can well change the contain of "Calibration" field if you find it necessary (and write for example altair_neon-2, my_calibration_ image, ...). 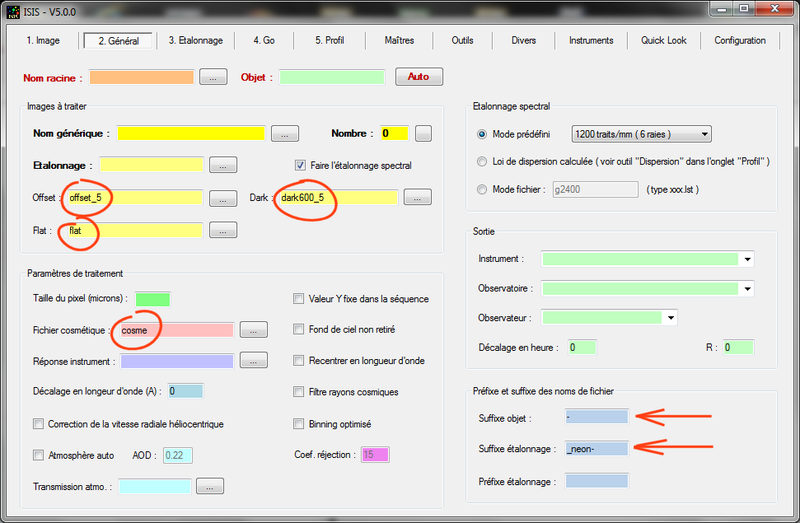 At this stage, the "General" tab dipose of enough information for process the spectrum. Open "Calibration" tab (just to the right of the "General" tab). More specifically, ISIS displays the first frame of the sequence to be processed. Note that the names "altair-1" and "altair_neon-1" were copied for you from tab "General". For further processing, ISIS needs the approximate vertical coordinate (in pixels around 5 or 6) of the spectrum trace of the spectrum. This measure must be taken to middle of the spectrum image (relative to the horizontal axis). It is possible to find this amount from the Y coordinate of the mouse pointer by moving it to center of the spectrum and reporting the value found in the "Spectrum vertical coordinate" field. You can go faster by double-clicking on the image with the cursor positioned on the middle of the trace. There are even simpler: if the "Auto" checkbox is enabled, ISIS calculates for you the next time "Calibration" tab is open. Here we have Y = 122 (the origin of coordinates in the image is taken at the bottom left). ISIS find a tilt angle of -0.28 ° (deviation from horizontal). Superimpose on the the image of a grid that specifying binning areas used to construct the spectral profile and defining the sky calculation areas. Note: the binning area (part where the pixels are summed along a vertical axis to construct the spectral profile) is flanked by two blue lines (22 pixels high). 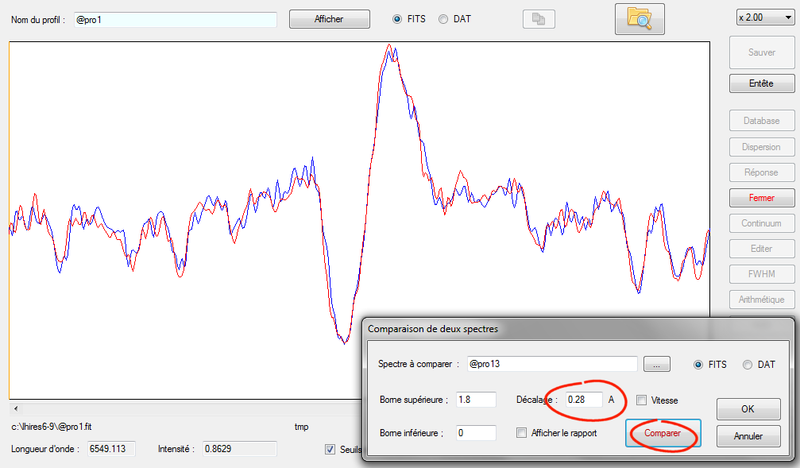 You can change the values interactively and see the effect in the image. 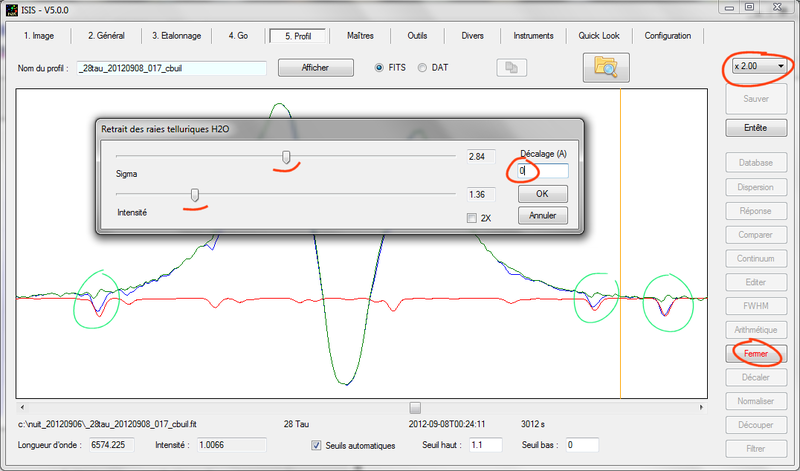 For convenience, I chose number 2 preset values, suitable for case treated. The coordinate of the line at 6506.528 A measured along the spectral axis (X axis) is equal to X = 319. ISIS need only an approximate value (+/- 3 or 4 pixels precision). The software will refine itself during processing. Note in passing that the meaning of the double-click with the mouse changes depending on the type image displayed (spectrum image to process or neon image). ISIS uses the upper and lower limits of the rectangle to calculate the value of slant angle of slant. The width of the rectangle does not influence the result, but it must howeve be wide enough to cover the line in its upper and lower parts. Depending on the shape of the rectangle, the result may vary: do worry, a difference of a few tenths of a degree will not change here basically the result of your processing. We find approximately -3.1°. Important Note: During a work session, it is unlikely that all numerical values that we are now entering change radically. 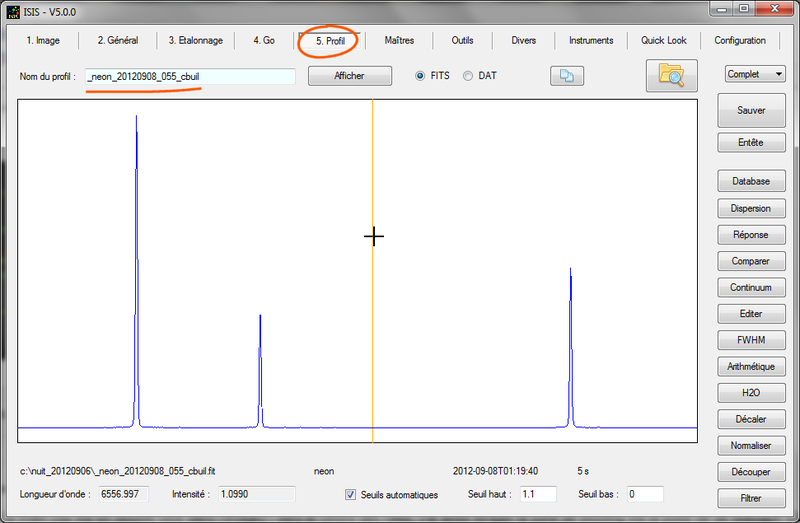 "Calibration" operation may be practically skipped when processing spectra following. A small control of the Y coordinate for the trace of the spectrum, however, does not wrong. 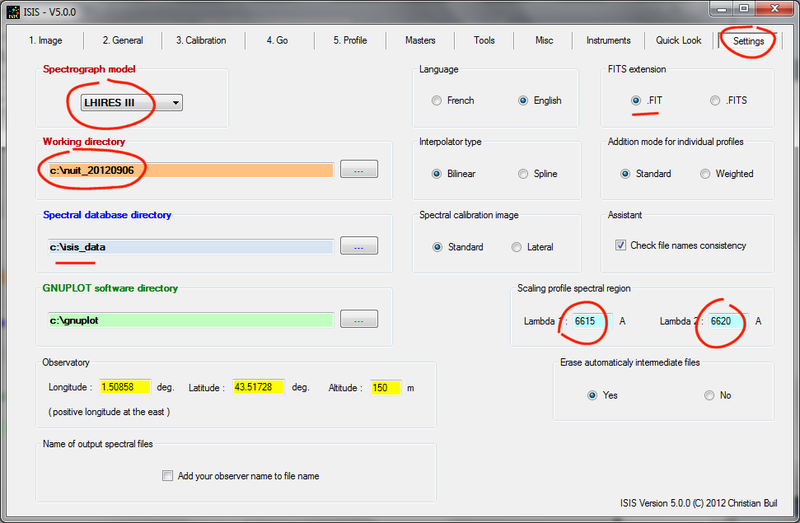 If you check the "Auto" option, the calculation is done in the background when opening the "Calibration" tab. You have nothing else to do so as simple visual inspection. 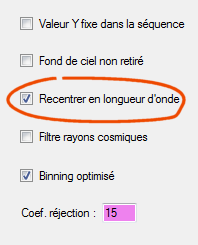 It is strongly recommended to select this option if you share with a community (database, observation campaign, ...). 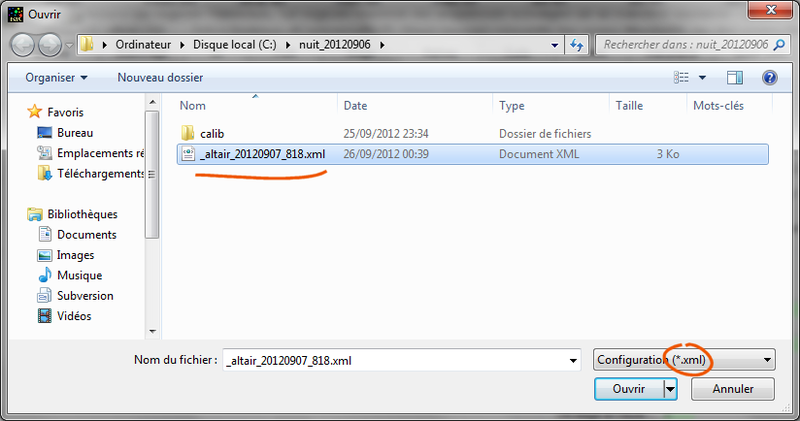 At the first look, the origin of the file can be identified. Think about making life easier for those who will exploit your spectra! Note that the spectrum is calibrated in wavelength. The Halpha line center is well approximates at wavelength of 6563 A. The choice of the processed type star at first is not trivial. 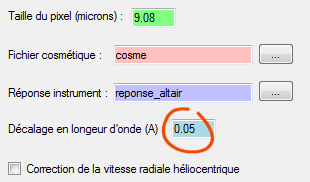 Altair is clean of fine spectral lines. This type of hot star (spectral type A or B) are ideal for calculate the instrumental response. This is what we do now. Here is a rigorous method that I recommend ... This is the hardest part of the processing, which requires more handling. But there is nothing insurmountable as you go see, I think! In addition, remember that these operations are to do that from time to time only (not necessarily for each work session). - Blue: Spectrum of your departure. - Red: The theoretical spectrum of the water vapor. 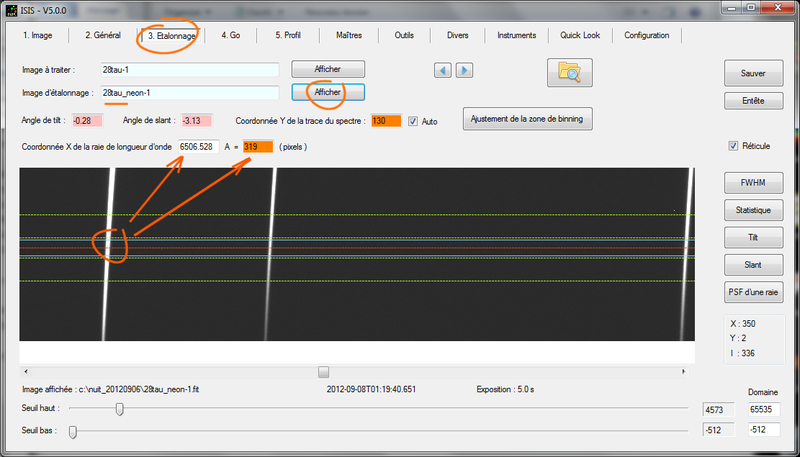 You can change its appearance by acting on the sliders in the dialog box (the cursor "Sigma" rule th linewidth, the cursor "Intensity" sets the depth). 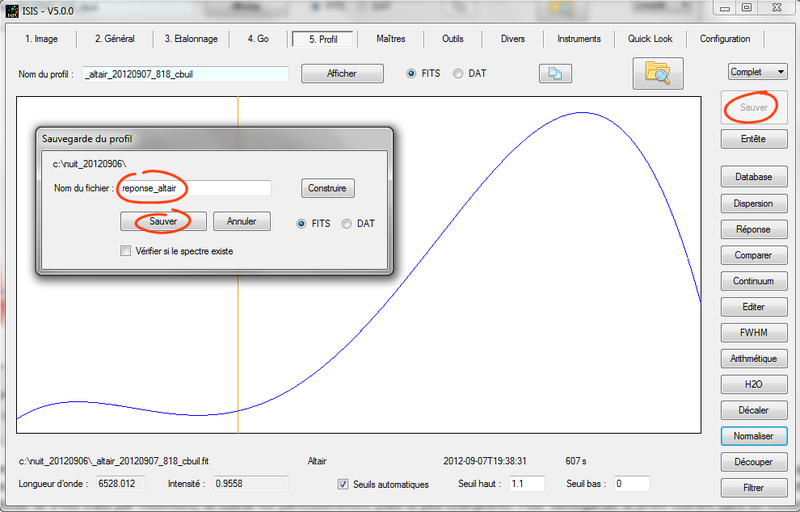 Do not hesitate to manipulate to see how the program reacts. - Green: The result of dividing the spectrum of the star and synthetic water vapor spectrum present. 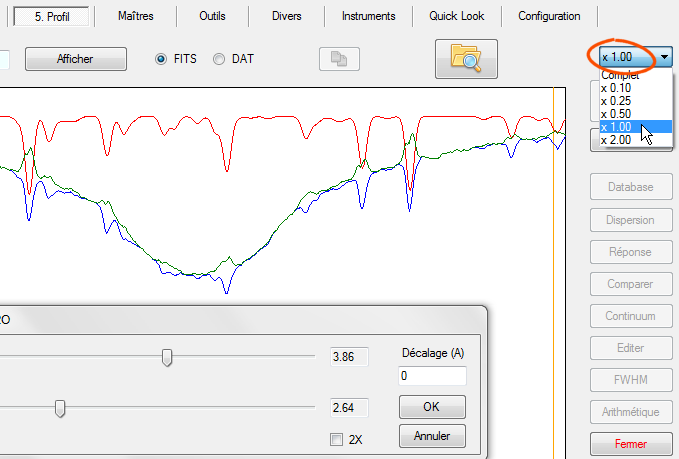 This spectrum is calculated each time you release the sliders for adjusting H2O spectral lines shape. Note the absence of telluric lines in the spectrum plotted in green. This is the goal. To get the result just shown, it was also necessary to produce a slight spectral difference between the star and H2O spectra. Here, the H2O spectrum is shifted 0.02 A for superimposed on the best telluric lines on the star. Change this shift value (which can be negative) and see how the ration spectrum (in green) change. To confirm your entry, please <Return> ont the keyboard, or move the slider cursor slightly. The spectral shift can be caused by mechanical flexure between the time of you acquire the star spectra and instant of internal neon lamp acquisition. For the present situation the spectral displacement of the observed spectrum of the star relative to the reference spectrum is very low here (it corresponds to a radial velocity of 1 km / s), but still detectable with the proposed procedure. 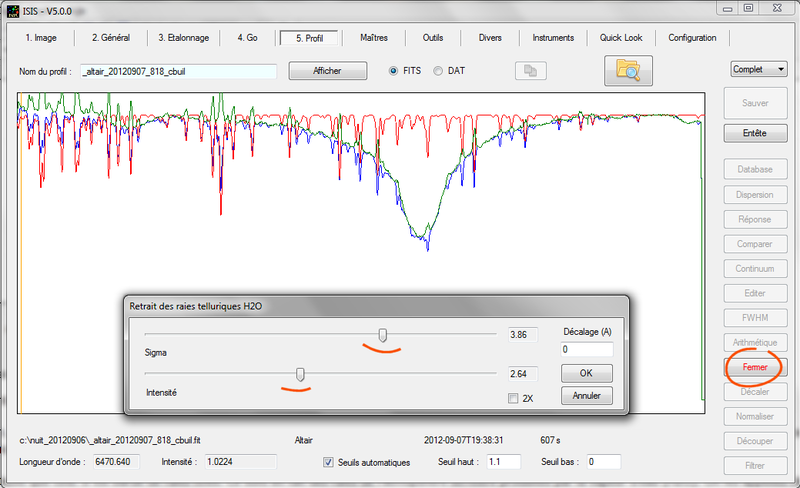 Comparison of a spectrum containing telluric with HO synthetic spectrum is a powerful method This is why it is very important to know how to use the tool "H2O". The value of "Sigma" is often a constant for your instrument. Unless a catastrophe on the side of the focus of the spectrum, the instrumental width your lines is always approximately the same. Ultimately, only the intensity is adjusted and optionally, a spectral shift. 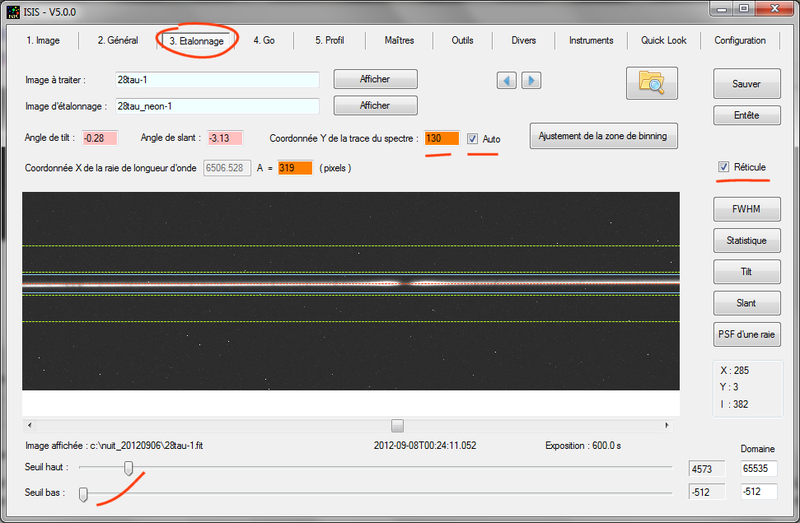 Telluric lines have been erased with good efficiency (residues on the left hand margin indicate calibration of lower quality in those parts of spectrum due to optical distortion: the spectrograph Lhires III is not calculated to cover as wide spectral area with this grating). - Green ratio: observed spectrum / reference spectrum, that is to say, the instrumental response. The given name is arbitrary. You have all the choices. Here, I chose to name "reponse_altair" because it is an instrumental response and I add the name of the star from which it was calculated (note that I never put the white characters in the names file!). Click the "Save" button. It is finished, the hardest part by far, you have your instrumental response (relative to an Elodie Altair spectrum, which we hope it reflects the true spectrum of this star, as if it were observed outside the Earth's atmosphere - this is already a good basis for work). The instrumental spectral response will help us to refine processing of all spectra of actual session and probably also the following sessions. Normally, with Lhires III spectra acquired with a 2400 lines per millimeter grating, the response curve is particularly flat and slightly changes as a function time - the main problem is finding them good reference spectra - spectra professionals is not always a guarantee. We provides the name of the instrumental response calculated (before ISIS was able to treat the spectrum, but by the approximation of a perfectly flat response). We took the opportunity to tell more in our ISIS spectrum has a spectral calibration error of 0.02 A when processes with the current settings. Remember, we found this value by comparison with the expected position of the H2O telluric lines. It's OK for Altair star, you can go to the next object ! telluric lines, which mean that the spectral calibration is excellent (do not mind the Halpha lines because presence of the spectral shift due to the Earth heliocentric velocity). The continuum is also very well restored through the processing treatment. 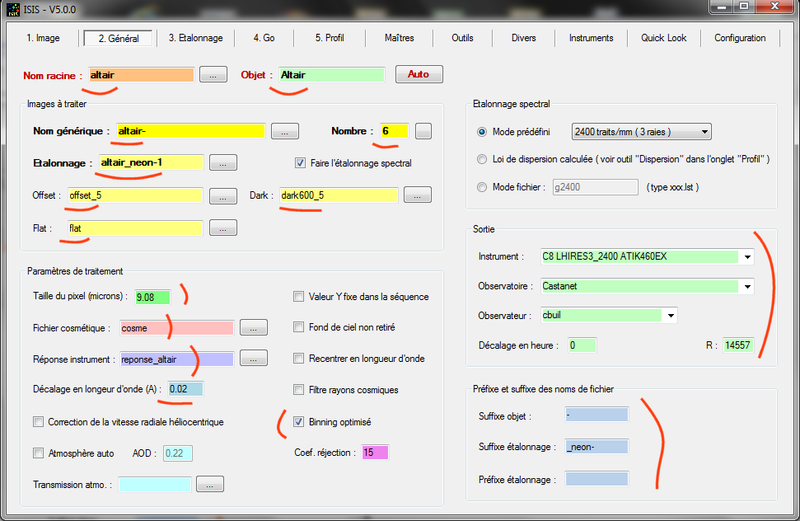 All parameters are green. Click "General" button (not the tab item). The "General" tab opens. It is already pre-filled. Your only job is to specify the catalog name for the object ("28 Tau"). detect that you deal with a new spectrum and if you do not have set to zero this field , it alerts you and asking for confirmation). You can process to the next star, and so on. The resultat is now perfect. Some recommendations and tips now. The associated rejection coefficient fixed force for removal of cosmic rays. The value 15 is a good choice in general. 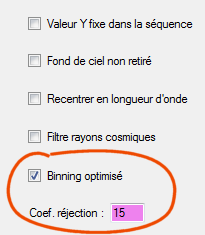 This optimized binning method is so powerful and effective (especially if you take spectra of very faint object) that it is recommended to always select ISIS the option (the signal to noise ation will be improved). Generally there will be no problems with the Lhires IIII spectra from Lhires III because they are well sampled by the pixels detector (about 3 pixels and more in the FWHM). 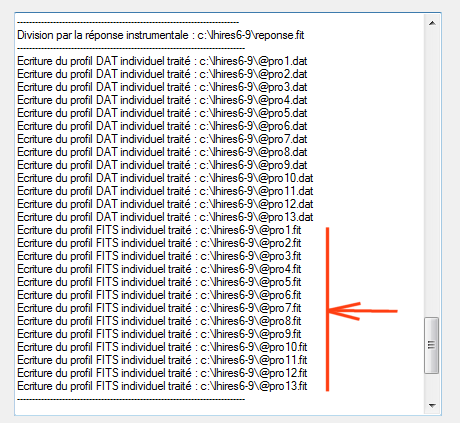 So, yes, with Lhires III, you can check this option (control the difference with and without this option in the final profile). However, it must be much more careful with LISA spectra or sometimes spectra acquired with simple Star Analyser grating. These spectra are often so thin that the filter can alter the real parts confusing them with cosmic rays. Therefore caution, and with these data, avoiding using such a filter, if possible. 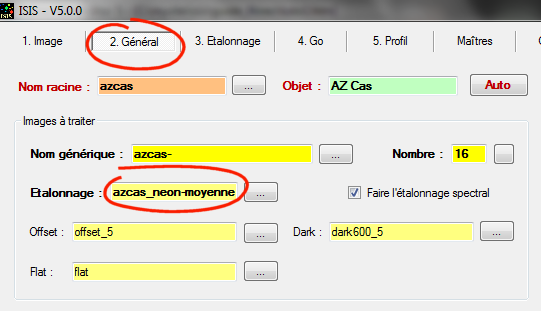 Then, use azcas_neon-1 as a reference because it is temporally located near the first image of the sequence (azcas-1), then, if possible, select the option "Wavelength registration" under ISIS (reminder, the software register relative to the first frame of the sequence). 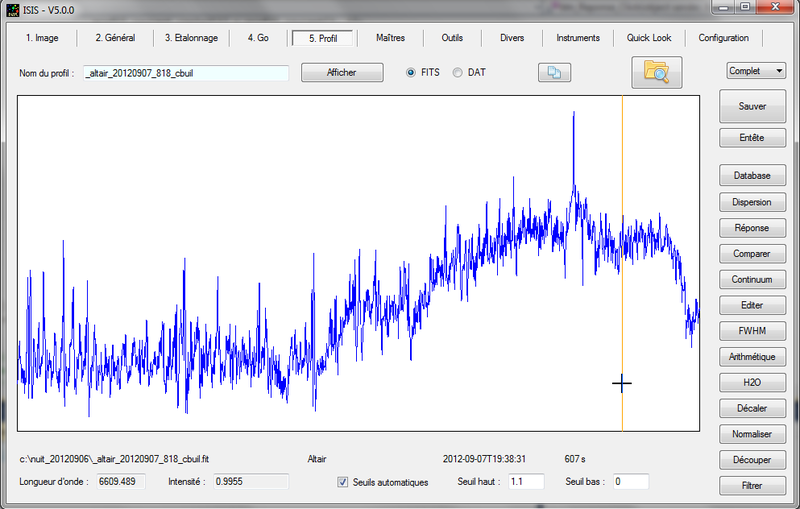 The image azcas_neon-2 serves as a control data. For the name of the object, we adopt "neon" - why not! Note the generic name provided: "28tau_neon-". This is ISIS will add the index number to build the full file name. Note that we have only a single image. Our neon spectrum is calibrated here with itself, that is why we adopt "28tau_neon_1" for the input calibration image name. 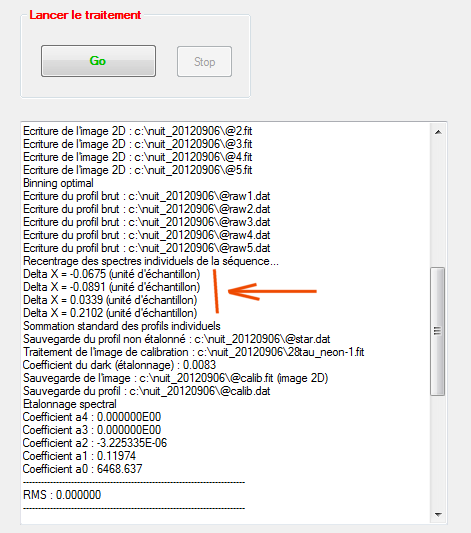 Tip: If you process only a single image and that it has no index number, you can enter the name in the "generic name" but you must specify a number of frames equal to zero. In this case, the indexing system is not activated. 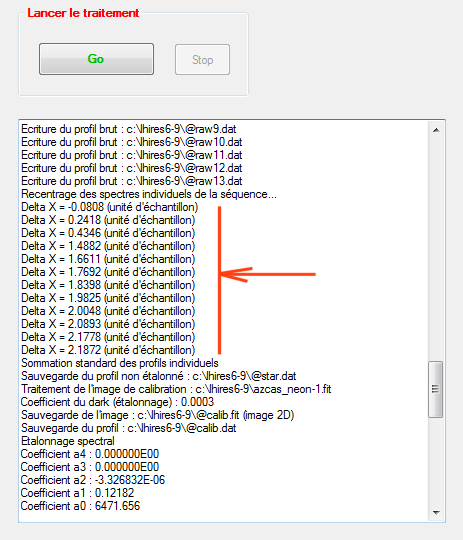 For example, the processing will work perfectly in our example if you specify a generic name like "28tau_neon-1" and a number of frames equal to 0 (ISIS does not then add an index number to the generic name). 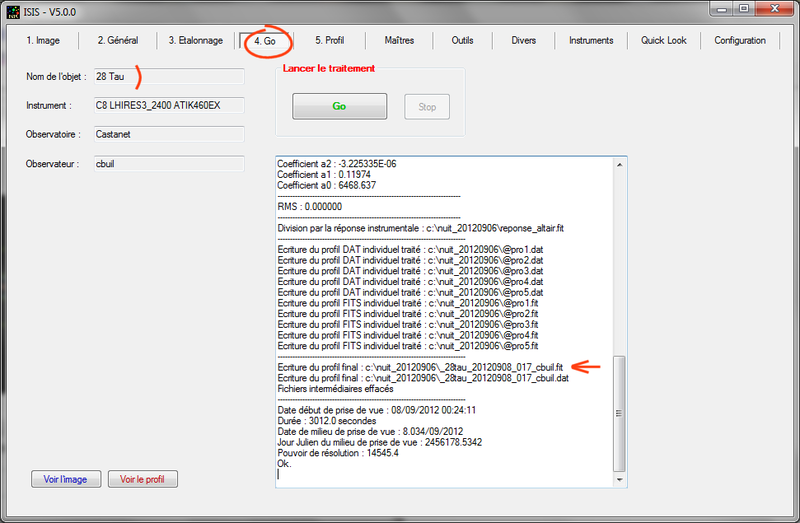 I also selected the option "fixed Y value for sequence." This prevents ISIS to perform shift on 2D images along the vertical axis for register individual spectra (needed for internal operations). The operation has no meaning when dealing with extended object spectra (non-pointual objet) and can even be harmful. simply disappear, which is not the goal. So we active a non removal sky background mode. The rest is unchanged in this tab. 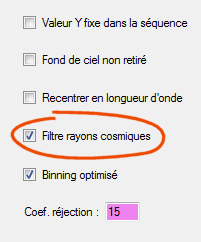 I unchecked the option "Auto" for the Y coordinate, I entered the value by hand (or by double-clicking in the image) - towards the center of the lines. 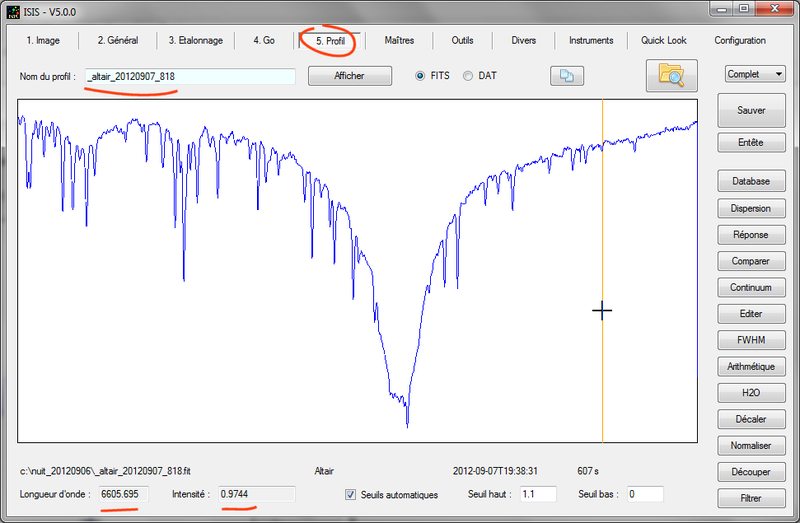 I also expanded the binning area via "Binning adjsutemnt" dialog box, the idea here is to have a generous signal and thus a spectral profile of quality (not to exaggerate the binning height because the lines are slightly curved and it would degrade the spectral resolution). There is nothing else to do in this tab. We have obtained Lhires III spectrograph neon lamp spectra. If you process a sequence of stellar spectra, this control image also contains the sum of all individual spectra. 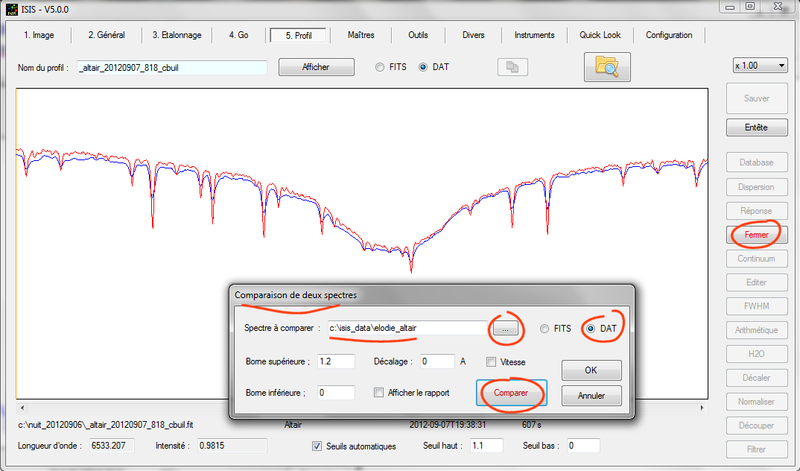 After this excursion in the domain of extended spectra processing we reprocess now stellar spectra, so think especially to uncheck the options "Fxed Y value for sequence" and "Sky not removed" and adjust the binning zone value if necessary. Do it right away to avoid nasty surprises! In this way, internal processing less smoothing the data. But, if your spectra are at the limit of sub-sampling as with LISA spectrograph instrumental in some configurations, the interpolation "Spline" may cause artifacts in the final profile. This is the reason for which the choice of the interpolator is available in ISIS. But what if your spectrograph uses a g600 lines/mm grating or if you are targeting the ultraviolet or infrared regions of the spectrum? We immediately recognize the wavelengths of three neon lines that we use from the beginning (6506.53, 6532.88, 6598.95) - a wavalength by line in the file. The first line of this file is the degree of the polynomial adopted for dispersion equation. A high degree can fit better dispersion of nonlinearity. But it is not always happy to work with a strong degree. This gain in accuracy may be an illusion. This is the case in especially if your calibration lines are all concentrated in the center of the image. In this case, the calibration of the edges of the spectrum may be catastrophic (a polynomial dispersion is made to interpolate, not extrapolate not). Anyway, if you have n lines of calibration, the maximum possible degree is n-1. In our example we have only 3 lines, and quite logically, the degree of dispersion equation is 2 - a good choice here. The maximum degree is accepted by ISIS is 4. The second line contains the dispersion (reciprocal) average in angstroms per pixel. In the example we have adopted 0.1139 A / pixel. 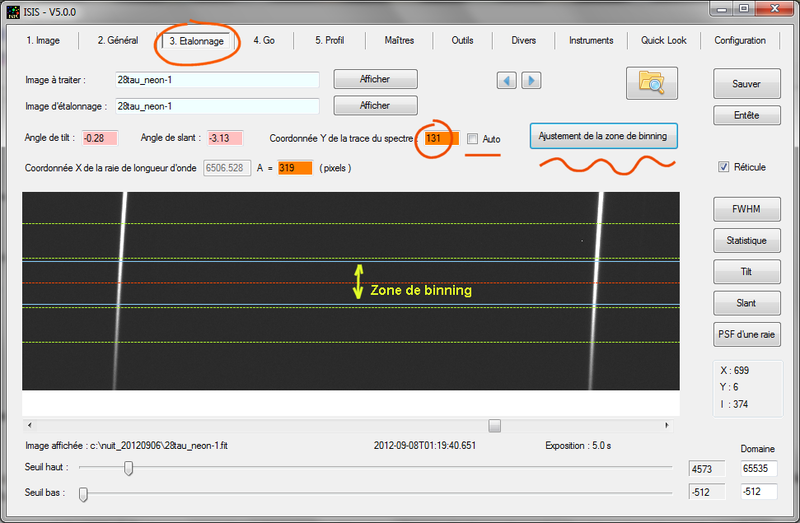 This value is easy to find: from the "Image" tab measure the gap distance in pixels between two known lines in the spectrum of the calibration lamp. The desired value is then equal to (difference in wavelength between the two lines) / (gap in pixels between the two pixel lines). There is no need to search high accuracy, it is right here a medium dispersion medium. 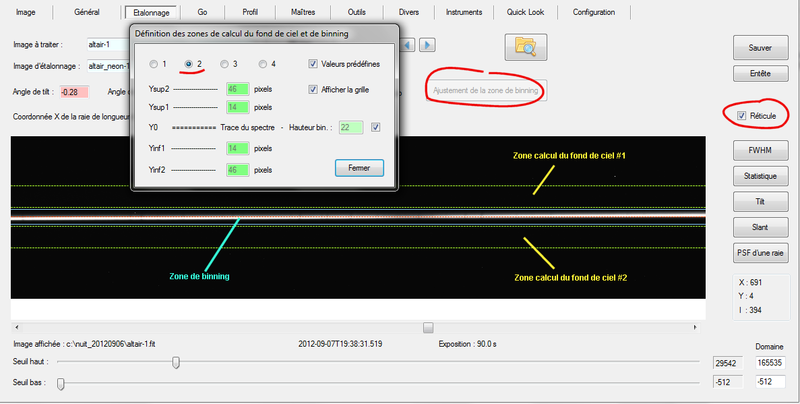 Finally found a list of lines present in calibration lamp, if possible bright, unsatured and well isolated. It can be an unlimited number. ISIS will automatically identify the lines in the spectrum. You can select any line (but if possible well exposed in the calibration image). Everything else is similar to the standard procedure described in this guide. If you made "Go" in this situation, you'll find exactly the same result as the calibration mode preset.